Tufflite Greenhouse Poly Film is the original "colorless" polyethylene greenhouse covering. For over twenty years, growers have covered their income (crops) with Tufflite. Tufflite Greenhouse Poly Film Covering was the first multi-year product incorporating the HALS Formula System (Hindered Amine Light Stabilizer) of ultraviolet inhibitors. Tufflite IV 6mil-A high clarity 6mil Tri-Layer covering warranted for four years. Contains UV block and an anti-dust additive. Tufflite IV 6mil Tubing -A high clarity 6mil Tri-Layer covering warranted for four years. Contains UV block and an anti-dust additive. Tufflite IV White-A 6mil white 55% shade Tri-Layer covering, designed to last four years. Contains all the features of Tufflite IV. Tufflite I (4mil sheets)-A warranted one year,4mil, Tri-Layer covering containing additives that block harmful UV rays and help to resist dust accumulation. Tufflite I (6mil sheets)-A warranted one year6mil, Tri-Layer covering containing additives that block harmful UV rays and help to resist dust accumulation. 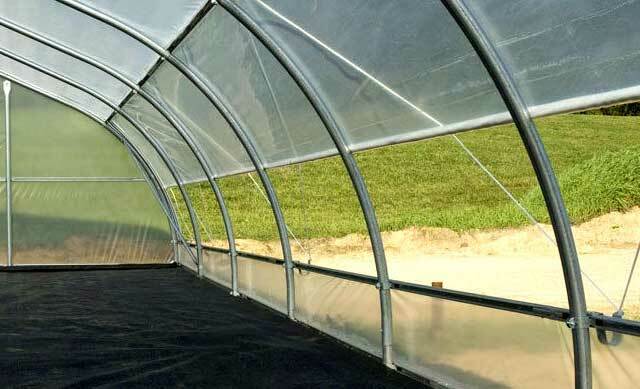 Tufflite Infrared (6mil sheets & 6mil Tubing)-A four year, 6mil Tri-Layer energy saving covering, with an additive that helps reduce condensation buildup on the film, plus an additional additive that disperses light and helps to delay the exit of heat from the greenhouse. Wiggle Wire: Used on thousands of greenhouses, Wiggle Wire has proven to be a low-cost, effective way to attach polyethylene or shade material to greenhouses. The aluminum base is easy to install and bends readily over any hoop configuration. Multiple layers of plastic and shade cloth can be installed and moved without disturbing the plastic. Inflation kits: Our pre-assembled roof inflation kit creates an insulating dead air space between a double layer poly roof forinflation kits greaterenergy efficiency and visual appeal. Gives you that nice tight, even poly look. Includes blower, heavy-duty mounting bracket, flex tube and air-transfer gaskets. Premium repair tape: Strong, conformable, transparent polyethylene film tape has excellent resistance to moisture, acids, chemicals, greenhouse preminm repai tape alkalis, oils, abrasion and weathering. Primarily used for splicing polyethylene film. Also ideal as a weather seal for applying plastic storm windows, door jams, and window casings in low temperature environments. » 6 mil, high-sheer, UV-resistant acrylic adhesive with excellent holding properties and cold stick. Excellent moisture barrier. Conforms well to irregular surfaces. Aluminum Tape: Aluminum Tape is a 2Mil self-wound, dead-soft aluminum foil, coated with an aggressive acrylic adhesive. Excellent chemical and moisture resistance. Ideal for electroplating, powder coating, duct sealing and paint stripping applications. Vent Tape: This vent tape is a 4mil non-woven synthetic fabric with an acrylic adhesive. Unique porous backing has a high air/gas permeability, good burst strength and solids barrier for minimal voids. It contains a fungicide for use in areas of high humidity. Applications include appliance insulation and vapor barrier protection.